A tequila martini, direct from Austin. Developing your own Signature House Drink makes guests feel special, and they will begin to look forward to and even count on that certain drink recipe you've perfected. It also adds a unique twist to your entertaining skills and impresses new guests and long-time friends alike. When making a Mexican Martini, choose your tequila carefully. There are many brands and colors of tequila these days, and they all vary in flavor and quality. Find the one you like best, or get one bottle of white (clear) tequila and one bottle of gold (amber) tequila and keep them on hand. My favorite tequila is Sauza Hornitos Tequila. It's a super premium 100% Blue Agave Resposado (resting) Tequila which does its resting in American oak containers for up to 6 months before being bottled. It's a pale, straw-colored, mellow tequila with a hint of fresh peppermint, and it makes a fine Mexican Martini. It's also more affordable than other 100 percent blue agave tequilas on the market. When purchasing the other ingredients for your Signature House Drink, be choosy again. Try not to purchase ingredients that contain loads of sugar. Your guests will feel sick from the sugar before they even finish the drink. Below is the recipe that's been circulating among my friends for a number of years now. Each household tries to improve on this basic recipe, but I like it just as it is. Of course, successful preparation of this martini will be more likely with the use of a good cocktail shaker and, as with all martinis, the Mexican Martini must be served in traditional style martini glasses with skewered fresh, plump olives. Fancy martini olives can be found in gourmet shops and liquor stores along with stainless steel cocktail skewers; how toothpicks are just fine for skewering. The splash of orange juice in the recipe below helps layer the levels of tartness, and gives the drink its punch. Pouring in a bit of the olive juice from the jar makes it "dirty", a common martini term, and imparts a little salty flavoring. It doesn't matter if you use gold or white tequila in this recipe, and the fresher the orange juice the better the drink. 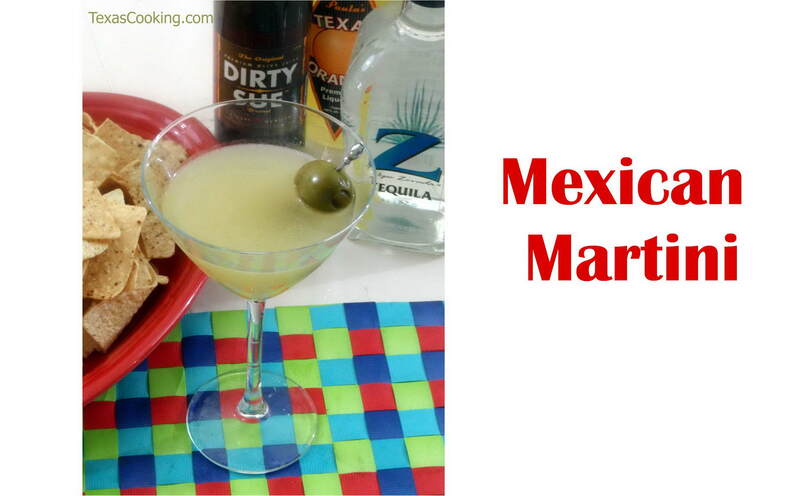 This recipe makes one large Mexican martini. Fill a 16-ounce cocktail shaker halfway with ice and add the first four ingredients. The amounts of fresh lime juice and olive juice negate any need for Sweet & Sour mix (if not using a cocktail shaker, add approximately 8 ounces). Shake until contents are mixed and chilled. Strain into martini glasses, and serve with skewered olives. So get out your bartender's apron and start polishing the glasses.